I bought a 1980 rabbit Convertible l that the previous owner had cut the top off, along with the straps and cables. Is there any information on the correct length of the straps and cables? My replacement top came with new side cables, but there were remnants of cables on the last two bows. Sorry, didnt see this. Blame my surgery, drugs, and then irmageddon. Top straps? The straps that are on the top and rivet to the rear frame ? Pull them out after top installed. Then with the frame closed and latched. Fold them over the pad and back up to frame rivet hole. Wrap it around rivet hole and Mark it. Use a hole punch to make a hole in the strapping,. Then raise the top and pop rivet or wire tie. Be sure if you wire tie,. Your cut end is inside the frame. Sorry for no pictures,. Irmageddon,. No power. In the how to, there are plenty of pictures. Cable length for sides are also in the how tos. There were two frames,. And it depends on which type you have. Early frames as yours should be from 79-82 sits higher, when folded. The length of the cable (please check how to) attaches to the top pad frame bow, then through top and hooks on the rear frame finger. Spring at front on bow. Newer style is attached to spring at rear frame through frame, through top, then hooked to teat, on front frame by handle. The lengths are a hard number old is like 40 inches, new is 37 1/4. Please check how tos.....for correct lengths. After looking in depth at the diagram regarding lubricating the top pivot points I have decided that I now need straps not cables. I have a set of straps for the rear window and that is it. Like I said I got a basket case, but I'm fairly handy at fabricating things. If I close but not latch the top, can I assume that is a good length to make the new straps? I was thinking to use some shoulder straps from various duffel bags from goodwill, any other suggestions? The rear straps that support the upper frame assembly to the frame? Or are you talking about the straps that run up the rear side corners of the top rear to the frame, or, the straps that are on the top outer cover itself. I never measured the length of the ones from the rear window frame top, to the center front bar. Installing the padding kit has the pictures. There are 3 steel cables. One each side to hold the top tight to the frame they are 37 1/4 or 40" long depending on which style of top that you have, and one long 94" that holds the top to the channel at the rear of the body called the Cable tray. This also has the 2 rear loops that hold the boot cover of the top when folded. There are 2 straps on each rear corner of the car, they are attached at the body of the car by a metal bracket and 2 10mm bolts. They are about 4 inches wide and hold a piece of foam to them to pad the top at the rear side corners, and are stapled to the left and right of the rear frame member. 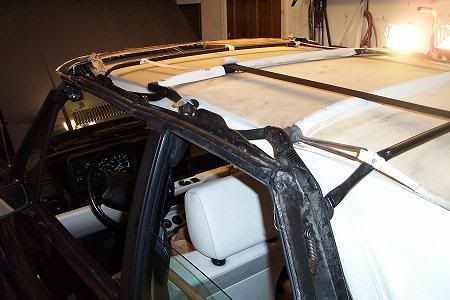 There are 2 Straps that hold the rear window frame at the top to the center frame via holes or slots in the rear frame. The straps are sewn with loops in then that hold the plastic dowels to keep them tight to the rear frame, and inserted from the outside portion of the window frame, then through the installed headliner and plastic trim pieces to the middle bar where they are placed over the bar and held in with curved metal plates that are fitted through a sewn loop in the strap and screwed into that bar from being half wrapped. They are fairly tight when the top is closed and latched, but do not interfere with the closure of the top. They support the padding that separates the top frame from the padding cover and pad. In each of the headliner, pad, and installation how to-s I have photos of said items. Going through some stuff I did find 2 white ribbon looking straps with a permanent curl in the middle, holes in the ends about 2 feet long and 1/2 inch wide, I think those look like the ones in the front, and I have 1 rubber band. The vinyl straps are used to hold the rubber bands. These screw into the frame and the rubber band is looped on the bar, then the strap holds the ends. See my headliner install as that strap is used to hold up the headliner at the rear. The rubber band is the same one that is used to secure the "balls" on the hood or the spare tire tools. I don't have ac, so no balls for me, and my tools are long gone. I did recently make it from Seattle wa to Sacramento ca this week. Only broke a throttle cable and a spark plug wire. Both of which are never locally available.